sleeping tents: prospector style tents that sleep 2 - 4 individuals, raised cot and 3-inch sleeping foam pads. Participants bring their own sleeping bag and moisture-resistant ground sheet. dining tent: contains kitchen and dining hall with picnic style tables and seating. 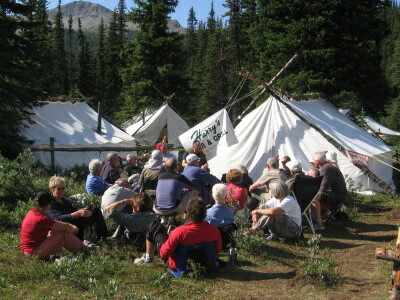 "donut" tent: used for meetings/briefings and evening entertainment, with campfire in center (smoke escaping through hole in top center, hence term "donut"). 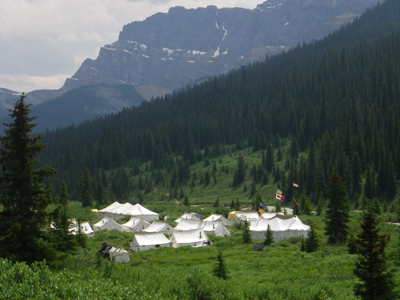 washup tents: male and female, with hot water made available at scheduled times throughout the day. biffies: enclosures containing a toilet seat common in most campgrounds. electrified fence: surrounds perimeter of camp site to keep unwelcome visitors at bay. Why doesn't my tent have a floor? In cooperation with Parks Canada, we work to ensure that our camps have the least possible impact on the wilderness environment. We use a waste-water filtering system and manage garbage so that nothing is left behind, and we set up the camp to minimize damage to the delicate mountain plants. Open floored tents allow the plants to breathe and to recover between camps, while a plastic ground sheet has little effect and is sufficient to keep your bed dry. To provide an enjoyable wilderness camp experience for participants, each of the five annual camps has the following in-camp staff. Camp Host / Hostess: in charge of all inside camp perimeter activities, including liaising with hired staff on issues and problems raised by participants. Chief Leader: in charge of all outside camp perimeter activities, including the hike programme. Camp Medic: takes care of medical needs of participants. Camp Musician: provides the musical entertainment and accompaniment. Hired staff: experienced cooks and camp handyman provided by the outfitter. Hearty, hot breakfast and dinner is served each day in camp. Bag lunches provided for the day hikes. Special dietary needs can be accommodated, but such requirements must be identified at time participant registers for camp. Meal and hot water times are posted. Outfitters area is off limits except at tea and meal times. Please attend the “donut” for information regarding the next day’s hikes, etc. Consider your tent-mates in our shared accommodations. 11:00 PM - quiet time. Stay in the donut to sing or talk after 11.00 PM. Intoxicants are welcome and you can join the Happy Hour Group “by the stream” where you can indulge in a before and/or after dinner drink or two. Be considerate of other hikers or staff. Problems? Please contact the camp host (not the outfitter or his staff). NOTE that there is neither cell phone nor Wi-Fi service at camp. Please ask your family to call the “on duty” person’s cell phone for the appropriate week. The contact names and numbers will be provided before you leave for camp. Each evening, someone from the camp (either the Chief Leader or the Host) will use the satellite phone to call the “on duty” person between 6 and 8 pm. Any emergency messages will be relayed at that time along with other daily information (e.g. weather report). If required, a hiker at camp can use the satellite phone to contact their family directly regarding an emergency. Copyright © 2015-2019 Skyline Hikers of the Canadian Rockies. All rights reserved.